Big Appetite. Big Competitions. Big Attitude…Big Bite. 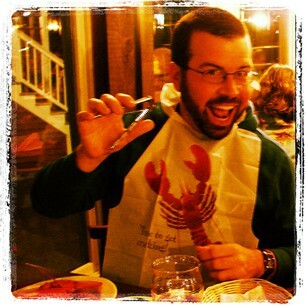 About Steve: Originally from New Hampshire, I moved to Philadelphia to work in theatre in 2006. I’ve been running a food blog since April 2010, where I post original recipes weekly. I fought hard in last year’s Chili Bowl, but my vegan dark chocolate chili was defeated by meaty concoctions. I’m gonna bring the pain this year! You’ll be up all night with the meat sweats after tasting my Chili of Brotherly Love! Chili Profile: Meat, meat and meat. Plus beer and braised beans (for good measure). Chilis above, below, and all through the middle. Best Chili in the City? Why? : National Mechanics – because they serve it with Fritos and cheese…. mmm! Prediction: I cook to win. I’m gonna smoke the competition like Texas brisket. Consider yourself warned! This entry was posted on Wednesday, February 20th, 2013 at 8:22 am	and posted in Chili Check-In. You can follow any responses to this entry through the RSS 2.0 feed. Philly Chili Bowl 2015 Judges!